Quick Takeaway: This is the uproariously funny chick-lit novel that inspired the movie by the same title. The book and movie are very different but are equally charming. Who Should Read This? This is definitely targeted towards chick-lit lovers who enjoy shopping at high-end brands. There is a lot of humor and romance, and the focus is absolutely plot over character development. Review: I think this is a wonderful frothy, fun book. I do my fair share of reading character-driven literary fiction, but sometimes, I just want to relax and read something that makes me laugh and doesn’t require a ton of thinking. 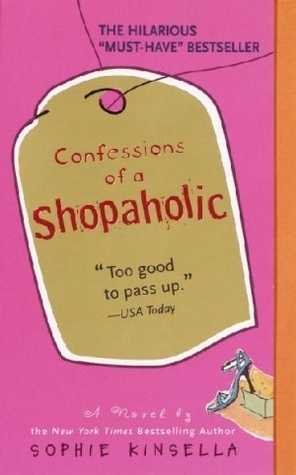 I am probably biased towards liking this book due to my potential shopping addiction. I have really enjoyed this series, especially the first three books. The main character, Becky Bloomwood, is a very endearing main character. She is flawed and often makes terrible decisions, but she is also very relatable and she is good at heart. I loved listening to her train of thought. I also really enjoyed both the romantic and friendship aspects of this book. While the scenarios are larger than life, the ultimate core of the situations and the emotions behind them are easily recognizable. Sure, Becky is a bit flaky and she sometimes doesn’t seem to have much common sense, but I still liked her and was rooting for her. This is a really fun series. For those who have seen the movie, there are lots of differences. For one, the character is British and she is living in England. Also, some of the things that happen in the movie actually take place in book two. The main “villain” Alicia is also very different in the book, though I don’t want to give too much away. Final Thoughts: If you are turned off by consumerism, give this one a pass. But if you are looking for something lighthearted with a hilarious main character who is really struggling to grow up, give this one a try! I have read some of these. She is a good writer.